Thousands of people are seriously injured or killed each year as the result of a workplace injury. These tragedies may occur in warehouses, on construction sites, and on roadways while driving "on the job". If you have been injured on the job, contact our Hayward, California, law firm to learn if you have a case. We focus our workplace injury practice on third-party claims. 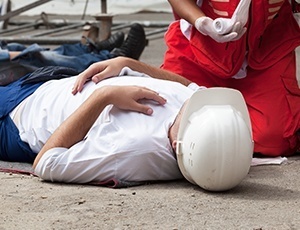 These claims arise when injuries are the result of an accident caused by the negligence or misconduct of someone not employed by the injured worker's company. An example of this type of case is a driver of a delivery van who is hit by a car or truck. Another example is an employee who is injured on a construction site by another company's employee. Damages for injuries caused by third parties may include pain and suffering, reimbursement for past and future lost income, and medical expenses not covered by workers' compensation. Our law firm has represented workers in third party cases involving defective or misused equipment, unsafe workplaces, and toxic exposure. Our lawyers have excellent relationships with local workers' compensation attorneys. We work with them to coordinate claims to ensure that clients obtain the full compensation to which they are entitled after a workplace injury. To learn more about third-party workplace accidents, contact our Northern California law firm, The Law Offices of Suizi Lin. Our lawyers have the experience, knowledge, and resources to develop a strong case for you. We serve Northern California communities such as Oakland, San Francisco, San Jose, Sacramento, Stockton, Santa Cruz/Monterey, and throughout Contra Costa County.